Long division is an important math skill that is typically introduced around 3rd grade or 4th grade depending on a student's fluency with basic division facts. These long division worksheets will help build confidence gradually when you're ready! Long division is a special milestone because it requires using several steps, an algorithm, that incorporates not only basic math facts from addition, subtraction and multiplication, but also because it requires a certain amount of intuition and problem solving. Even multi-digit multiplication is fairly mechanical compared to the skills necessary to solve a long division problem by hand. These long division worksheets provide problems of varying levels of difficulty to ease into this process gently. Especially if you are introducing long division in 3rd grade, you'll find the range of complexities in the sheets a gentle introduction to this often fearsome math subject! Long division worksheets that do not produce quotients with remainders. When you are first learning the long division steps, these worksheets are the place to start. These long division worksheets have quotients with remainders. Each worksheet includes detailed, expanded answers that show how to do long division step by step. Worksheets with the world's longest long division problems! Practice with these will banish the fear of the long division monster! These long division worksheets focus on factors of 25. 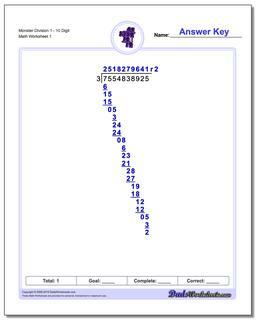 There are two groups of worksheets, including sets with remainders and sets without remainders. 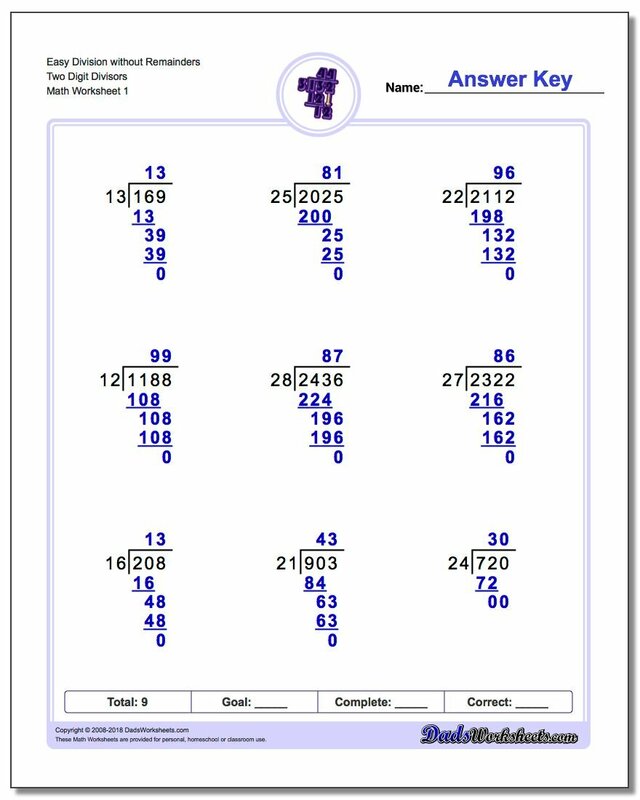 Long division worksheets with multiple-digit divisors, sets with and and sets without remainders. 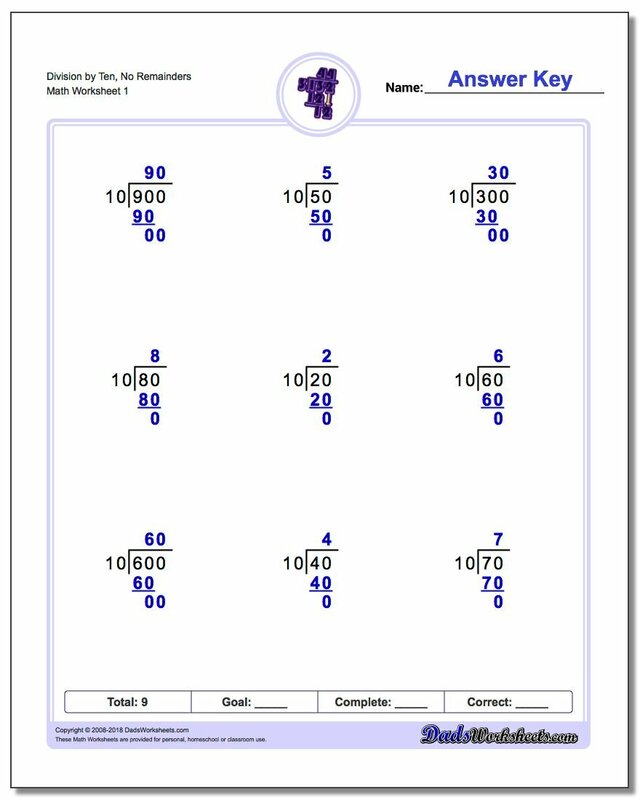 This worksheets start with simple problems that help master multiple digit divisors and build confidence before progressing to more difficult long division problems. Learning how to do long division is a critical milestone in mathematics education. Long division, like longer multiplication, requires several steps to calculate an answer. However, long division is one of the first procedures where finding the correct answer may require some trail and error approaches or experimentation. Often determining the correct next step in a long division problem, especially multiple digit long division, may require making an 'educated guess' to determine the next digit for the quotient. Checking that guess in the multiplication step of the long division algorithm is critical, insuring that the result at that stage of problem is less than the actual divisor. Many students struggle with these more complicated procedures, and that often makes long division feel like more of a challenge than it should. Throw in long division with remainders or long division with decimals, and the landscape truly becomes a minefield of frustration.